Welcome to our second issue of Commonplace. My father’s great uncle Alfred grew up at 21 West 52nd Street in midtown Manhattan. That same house is now 21, a legendary restaurant and hangout for celebrities and New York City cognoscenti. Speaking of which, cognizant Uncle Alfred seems to have pulled a good one over on his parents. He convinced them he was not up to office work in the family tea and import-export business. He spent winters in Florida, spring in Baja California, summers in Oregon’s Klamath Basin, and the fall on the coast of Maine — coincidentally following the best trout fishing and salmon runs in America. Uncle Alfred fishing in Eastern Oregon. 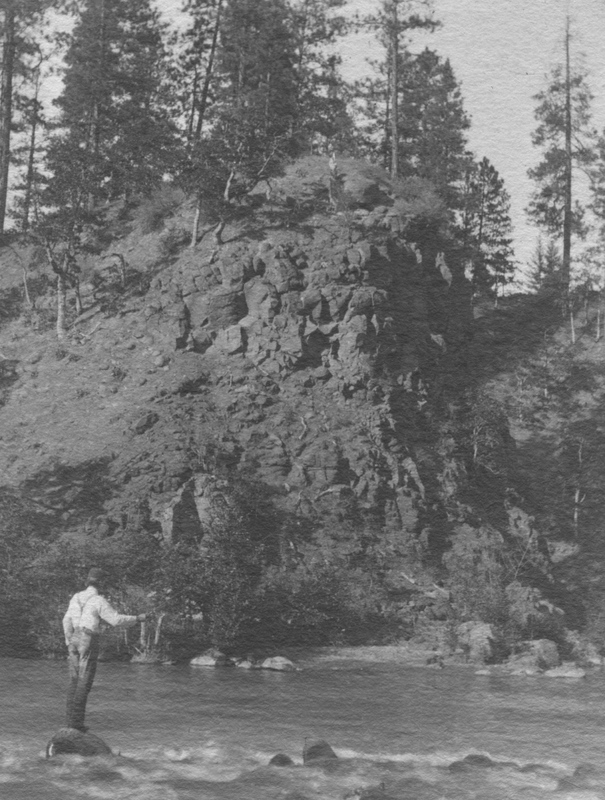 In Recreations of a Sportsman on the Pacific Coast (G P Putnam’s Sons, 1910), Charles Frederick Holder recounted his visit with “a mild-mannered and gentle man” Alfred L. Beebe at the cabin he had built on Pelican Bay and Crystal Creek on the northwest corner of Upper Klamath Lake, Oregon. There Alfred fly-fished for enormous trout, hunted, and trapped his way to expertise in the field. Sugar pines that grow from one hundred to three hundred feet into the air, pillars supporting the sky, western white pines from one hundred to two hundred feet, Balfour pines nearly one hundred feet in height, black pines, looming one hundred fifty feet, Douglas fir, three hundred feet, white fir, two hundred feet, Shasta fir, three hundred feet, Pacific red cedar, two hundred and fifty feet. 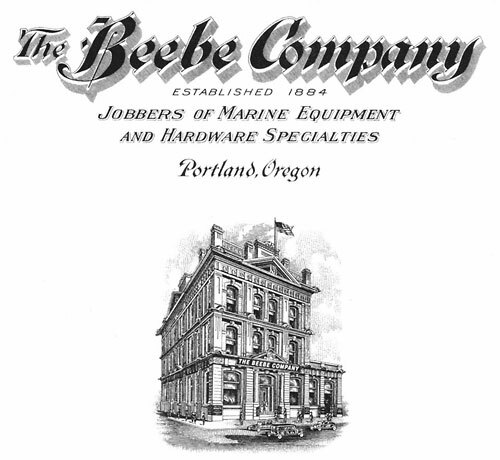 Uncle Alfred’s older brother, my great grandfather Charles Francis Beebe, lacked his fishing skills and was sent to Portland in 1884 to establish The Beebe Company, shipping agents and purveyors of fishing and marine supplies. C.F. was prominent in early Portland business and civic life, a good Presbyterian, and was appointed General of the Oregon National Guard. He was a small, courtly man with impeccable manners. He enjoyed sailing the Beebe Company’s Bonnie “Muriel” for men-only business entertainment. Charles Francis Beebe and company — sailing the regatta to Astoria on the MV Muriel. 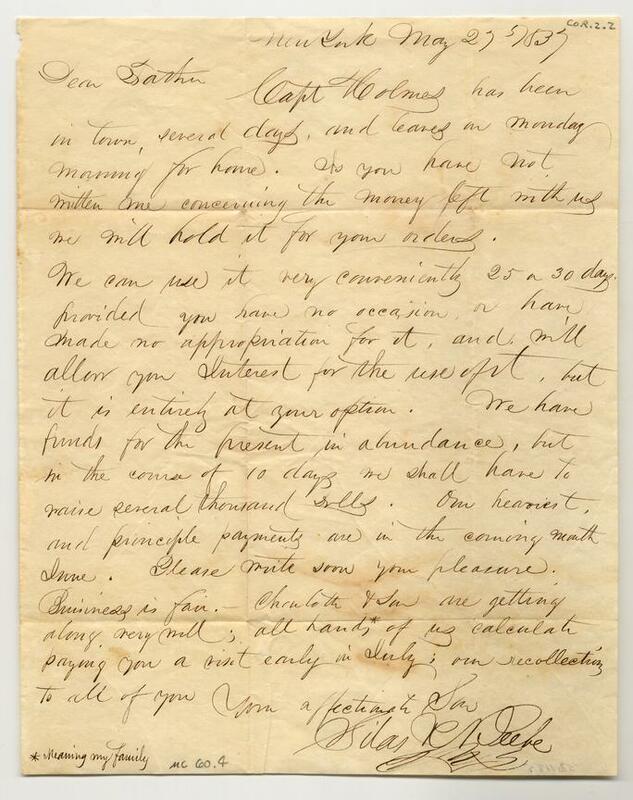 The General was one of my eight great-grandparents who settled in Oregon in the late 1800s. Family albums are full of excursions to climb Mt. Hood, hunt big game in the mountains, camp and steelhead fish on the Deschutes River, and picnic on the beach. Great Grandpa Biddle bought Beacon Rock on the Washington side of the Columbia River to keep it from being ground up for highway gravel and built a trail to the top. When the State of Washington declined it as a gift, it was offered to Oregon, whereupon Washington’s governor capitulated. It is now a Washington State Park and the trail to the top ends in a spectacular view of the Columbia River Gorge, Mt. Hood, and Oregon country beyond. Beebe family boarding the Ilwaco Railroad down to the beach for the weekend. Beebe relatives at mountain lake. The author's great grandmother Emma Bowne Beebe with friends in Central Oregon. Grandfather Gerald E. Beebe sailing the MV Muriel down the Columbia River. Lumberjacks working through an old ponderosa pine. Emma Bowne Beebe in old growth coastal forest. General Charles Francis Beebe at Ft. Clatsop, with the Oregon National Guard. The author with friend Hunter Smith, falcon Thea, and dog Toby at Gearhart at age thirteen or fourteen. The author's grandmother, Mary Livingstone Beebe, in Gearhart, Oregon. Emma Bowne Beebe driving the Old Columbia River Highway in the snow. The author's great grandfather, Henry Jonathan Biddle (right), with his daughter, Rebecca Biddle (center), and son, Spencer Biddle, on the banks of the Deschutes River. Hat in hand, General Beebe-style, exploring the development of new institutions and institutional relationships, while accepting failure politely, seems a good starting point. This issue of Commonplace is designed to find those new pioneers and restless souls who are scouting new territory, bringing fresh thinking, and taking courageous action. Nine multimedia stories focus on people and organizations spawning new business models, reorganizing around nature, bridging ideological divides. They are shaping a more humane, more restorative economy, from the rural corners of the state in that same Klamath Basin — now water-starved — to the fire-prone forests of southwest Oregon to Portland’s poorest neighborhoods. Stories also cover the Willamette Valley’s migrant worker communities, land stewards on eastern Oregon’s Umatilla Reservation, and rural grocery owners across the state. There’s a portrait by Jim Norton about returning to an older salmon life-cycle narrative, and shedding our current industrial approach. These stories are all illustrating a path to reconciliation in a state very different in so many ways than the one Uncle Alfred found one hundred years ago. And yet, it is still blessed with the same awe-inspiring landscape. A place worth calling home, and protecting accordingly. Spencer Biddle Beebe, Ecotrust founder and board chairman, is the author of Cache: Creating Natural Economies. After serving fourteen years with The Nature Conservancy as northwest representative, western regional director, vice president, and president of the Nature Conservancy’s International Program, he was the founding president of Conservation International in 1987. In February 1991, Spencer founded Ecotrust; with Shorebank Corporation of Chicago he helped found ShoreBank Pacific, the first environmental bank, now Beneficial State Bank. He also serves as chairman of Ecotrust Forest Management, Inc.